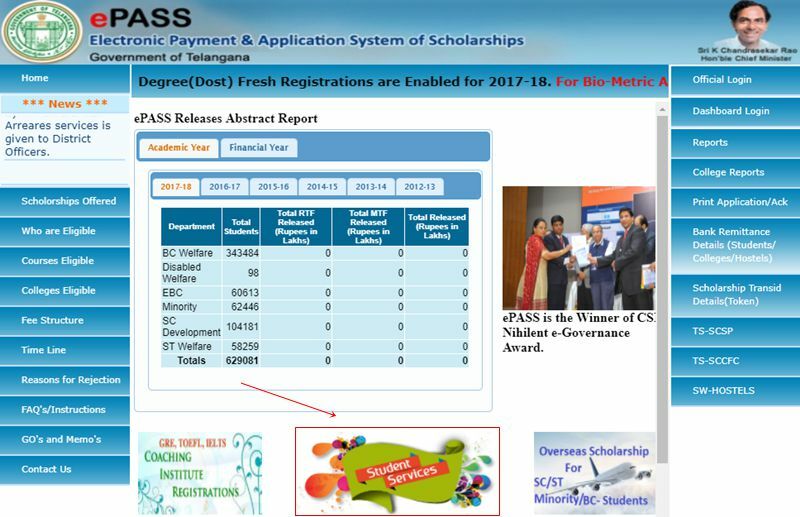 Telangana Postmatric Scholarships (Epass) For Renewal Registration date released, it is For 2018-2019 Academic Year. Telangana Govt. is providing financial assistance to students who belong to economically backward section. The reservation candidates belongs to SC/ST/BC categories with lower income levels are eligible to claim e-pass scholarship. The students who are perusing their undergraduate courses in state of Telangana are eligible to get the scholarship from TS Govt. The eligible students to get e-pass Scholarship can apply online through, www.telanganaepass.cgg.gov.in. Telangana Government has announced scholarship notification for students for the year 2018-19. The candidates who are eligible to claim scholarship have been already applied through online within the specified dates announced by the TS Govt. Now students can get updated with their e-pass scholarship status 2017 on the Official Website of TS Govt. , www.telanganaepass.cgg.gov.in. Post-matric Scheme Renewal Student Registrations(2018-19) are opened. For Applying The Epass Scholarship Renewal Registration we need some documents for further verification’s, its for all the castes those who are poor. So many Students are not aware of Epass Scholarship Renewal Registration. It is very careful while applying because without having careful you application must not approve. So for the students sake we are showing step by step process. 1) In case of change of Bank account, open your Zero balance account in any of the nationlized banks (Click here for the list of nationalised banks). Bank account not required For EBC students. 2) Student should have a Mobile Number for receiving One Time Password for registration (Mobile number may belong to the student or any one of his/her family members). Passed/Promoted Marks Memo of Previous year. Original Income Affidavit (signed by the Student & the Parent) Download format for affidavit. Note: If Any Problem in getting Password to Your Mobile, Go to nearest Meeseva/eSeva/APonline Centers For Registering With out Password. This application fully supported by IE8 and Mozilla Firefox. I have uploaded income certificate instead of income affidavit for renewal epass scholarship. Can i edit this document? Wrong documents uploded in fresh 2018-19 registration of scholarship so please tell me when edit option will be available to upload correct document in 2018-19 application form. Can you please tell me when will be the edit option of epass application telagana 2018-19 for 1st btech. Unfortunately I made a huge mistake. I hope you will reply soon. Did u get any information regarding edit option in 2018-19 scholarship form grom any other sources??? If so please tell me.